We've put together a little contest to encourage designers to share their projects, we're offering $1,000 in prizes (and 1 Gadget Gangster T-shirt, which is practically priceless). The contest is simple - Post a cool project! There's more info on our site. In other news, I've created a reference design for Parallax Propellers on the Full Board. Photos n' all. Feel free to use this as the base for any prop project. You can download it here (1.5MB odt) (pdf). Also, a few new projects; I put up a Music Visualizer (I just converted the open source Pixelmusic project). Turd (from the forums) put up a parallel port LCD. The "Designers Contest" honorable mention prize of a Gadget Gangster T-shirt has now been upgraded to a Gadget Gangster HOODIE. BOOM! If you had been holding off because you live in an icy tundra or the artic circle... you probably should still wait, because this hoodie won't be enough. BUT, if you live in just a 'chilly' area, the sweet warmth of a 100% cotton, double stitched hoodie is just a project away! Also, if you're considering entering, you should sign up and get a set of project boards. We send them out, free, when you sign up. You'll need these boards to design your project on & they'll be helpful in building your howto. You can sign up here. Just 1 week left for the contest - A fair number of entrants so far. If you have any entry, make sure to get in before the end of the month! Pretty good stuff! Of course, if you'd like to share your project, you can sign up on the site. The Winners of the Designer Contest have been announced! You can see the winners and find out about our second promotion here. I got a package from Nick to day. 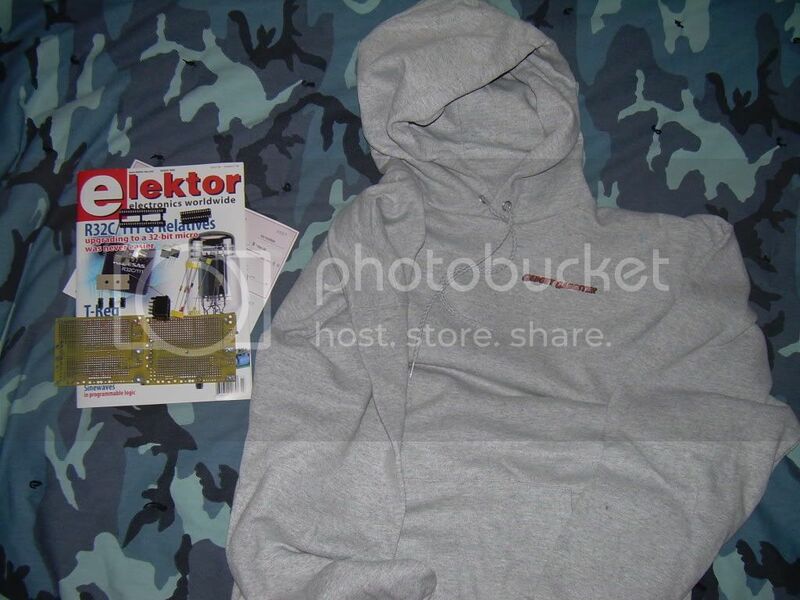 I got a couple boards and parts, a hoodie and my second place prize, a check for $250us!